Spinach plants were exposed to magnetic field from germination up to maturation, a period of 60 days. The levels of magnetic flux density were 0.5, 1.0, 1.5 and 2.0 mT while exposure time was 10 minutes, 30 minutes and 60 minutes. After 60 days the concentration of iron, calcium, potassium, sodium, magnesium and calcium was analyzed using Atomic Absorbance spectrophotometry. The data was analyzed using excel. Magnetic flux density from (0.5-2) mT and exposure time of (10-60) minutes has a significant effect on elemental composition elements in the leaves of spinach. Mineral deficiency is a major challenge facing the world population. About 40% of the world population which is about 2 billion people suffers from anemia, while 1 out of every 5 people in the world is at risk of zinc deficiency . However in developing countries, majority in Africa, this problem is more severe. In Sub Saharan Africa and Indian sub continental almost 90% of expectant mothers have anemia. Kenya, being one of these countries faces the same problem, 35% of children under 5 years are stunted while 4% are underweight and 1 out of 10 children are born with low birth weight. The cost of these nutrition problem has a profound cost implications on Kenya which include: 2.5% drop in adult income due to childhood anemia, impaired cognitive development which affects the country’s productivity and deaths . Magnetic field exposures to seeds, irrigation water and plants have an effect on the plants that result from them. These changes include an alteration in germination time [3-5] germination percentage for seeds [6-8] and faster growth in early growth stages for seeds exposed to magnetic field [9-11]. Irrigation water and exposure of magnetic field to plants have also shown to alter the growth and nutritional value of the yield of plants [12-14]. Exposure of magnetic flux density of magnetic flux density of 10, 50, 100 mT and exposure time of 0, 30, 60, 180, 240 and 360 min had an increased concentration of calcium, iron, potassium and sodium in date palm . However, most studies have focused on the effect of magnetic field on plants in its early stages of growth, there is therefore a need to investigate the effect of magnetic field on the elemental composition on spinach’s elemental composition after exposure on its whole lifespan. The main theories that have been used to explain how magnetic fields affect plants are the ion Cyclotron theory [15,16], Radical pair mechanism [17,18] and the magneto hydrodynamics . Among the three theories, the ICR theory tends to explain the effect of magnetic field on the elemental composition of plants. ICR theory asserts that exposure of magnetic field to plants that resonates with certain ions can accelerate their entry into the cells, and thereby increase the concentration of such elements into plants and also lead to some morphological changes in plants due to accumulation of such elements [20,21]. According to ICR theory there ought to be a matching between the frequency and magnetic flux density according to the following formulae . Where f is the frequency of magnetic field used, q is the ionic charge, m is the mass of an ion and B is the magnetic flux density. The ICR theory has been validated by experiments that have used the theory and gotten results that support it. Examples are the exposure of Arabidopsis thaliana to magnetic flux density of 65 μT at a frequency of 16Hz led to an increase in the concentration of calcium ions . However this theory has been contradicted by the fact that experiments that have used magnetic field and frequencies other than those advocated by ICR and have led to an alteration of the elemental composition in plants [24,25]. The main important factors to determine how magnetic field affect plants are the frequency, time of exposure. And magnetic flux density and the type of magnetic field [26-29]. This study explores the effect of static magnetic field because earlier studies have shown that static magnetic field is more beneficial or results to more positive results as compared to alternating magnetic field [30-33]. The magnetic flux density of (0.5-2) mT has been chosen because theoretically, magnetic flux density increases the amount of triplet states and its important to study how such an effect will have on the concentration of elements in spinach [34-37]. A strict pot experiment was carried out in a greenhouse at Egerton University (00 22, 11.0” S, 350 55’ 58.0” E). The test plant was Fordhook Giant Swiss Chard, a variety of spinach, which is well adapted to local environmental conditions. Pots were filled with 2 kg of soil then seeds without visible defect, insect damage and malformation were selected and sown at 4 seeds per pot. After emergence thinning was done on the criteria of the health of the seedlings to remain with two seedlings per pot. Phosphorus (P) application was 112 kg/ha, nitrogen quantities was applied at a rate of of 224 kg/ha. Watering was done twice a day, in the morning and evening, and the quantity used depended on the age and the field capacity of the soil. The experiment was designed to stimulate conditions of growth identical to those in natural surroundings. The magnetic flux density was generated by the Helmholtz coils system. The Helmholtz coil system consists of 2 coils, each formed by 1000 turns of 1 mm copper wire, with a mean diameter of 260 mm and thickness of 25 mm as shown in Figure 1. The coils were placed co-axially and placed at a distance of 130 mm from each other. The coils were connected to a power source and current was adjusted to get the required magnetic flux density. When current passes through the coils, a vertical magnetic field was generated in the center of the coil. The plants were placed at the center of the coil to be exposed to the magnetic field. Magnetic flux density was measured by a Digital Gauss meter with a Hall probe. Figure 1. The schematic representation of the magnetic flux density exposure designs showing the arrangement of Helmholtz coils. The potted spinach plants were exposed to various levels of magnetic flux density and duration daily for 60 days continuously. The treatments were imposed on the plants after emergence. The experimental design was a Completely Randomized Design (CRD) with 12 treatments. The treatments were made up of two variables, the magnetic flux density applied at four levels and duration treatment at three levels (Table 1). Each treatment consisted of four plants so that there were three replicates. Table 1. Types of Treatment with respect to magnetic flux density. The leaves were crushed, grinded in a mortar. Dry ashing method was adopted by placing the properly dried sample into the versatile crucible overnight in an electric muffle furnace maintaining the temperature between 400-440°C. This ashing was done to destroy all the organic material from the sample. The ash was removed from crucible and dried in desiccators. A 1 gm of ash was taken and digested using conc. HNO3, H2SO4 and HClO4 in the ratio of 10:6:3. Digested ashes was stored in sterilized bottles and used for the determination of Ca, Zn, Mg, Fe, Na, and P by flame atomic absorption spectroscopy. Then using the standard curves, the concentration of these elements were obtained for Potassium concentration, Sodium concentration, Zinc concentration, Magnesium concentration, Calcium concentration as shown in Figures 2-6 respectively. The actual concentrations of elements in the samples was worked out from the results that will be obtained from AAS read Black method . This study shows that there are specific trends in mineral concentration for each element in spinach after exposure of spinach to magnetic field. 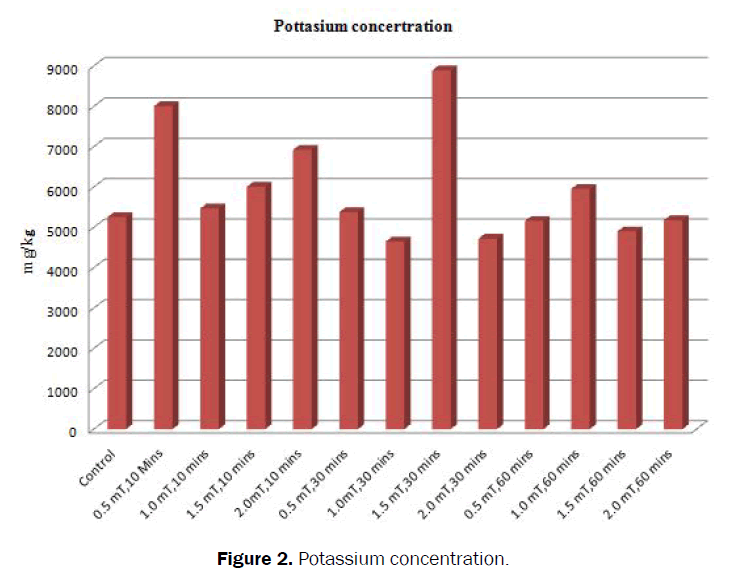 For potassium, there is a slight change in mineral concentration after exposure to magnetic field, however there is a remarkable increase for (0.5 mT, 10 minutes) and (1.5 mT, 30 minutes). 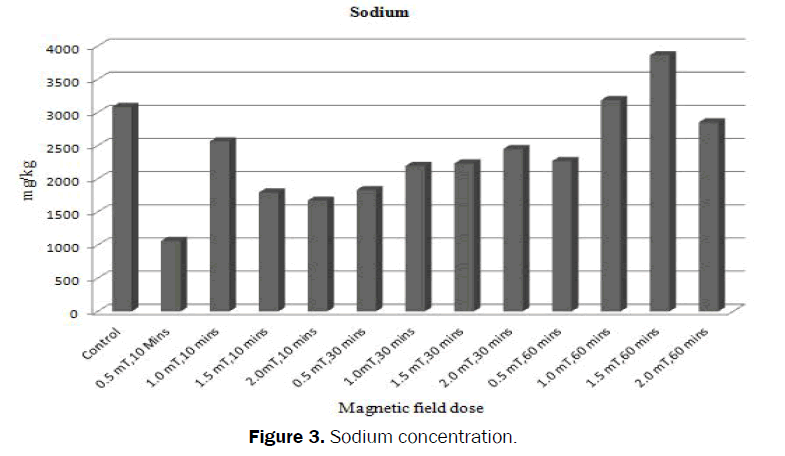 Sodium ions tend to increase with increase in both time and magnetic flux density, however, however there is an inhibitory effect as the amount is less the control except for (1.5 mT, 60 minutes). 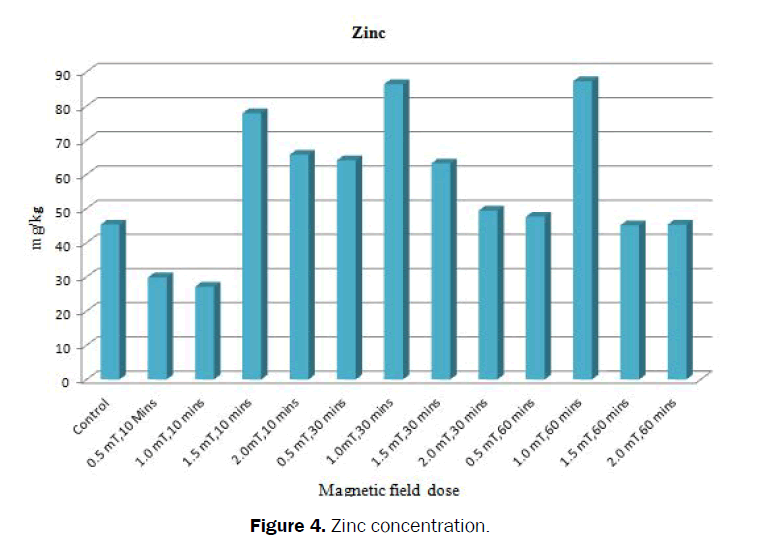 There is an increase in zinc as time of exposure decreases from 2.0 mT towards the control, however there is a remarkable increase in (1.5 mT, 10 minutes), (1.5 mT, 30 minutes) and (1.5 mT, 60 minutes). 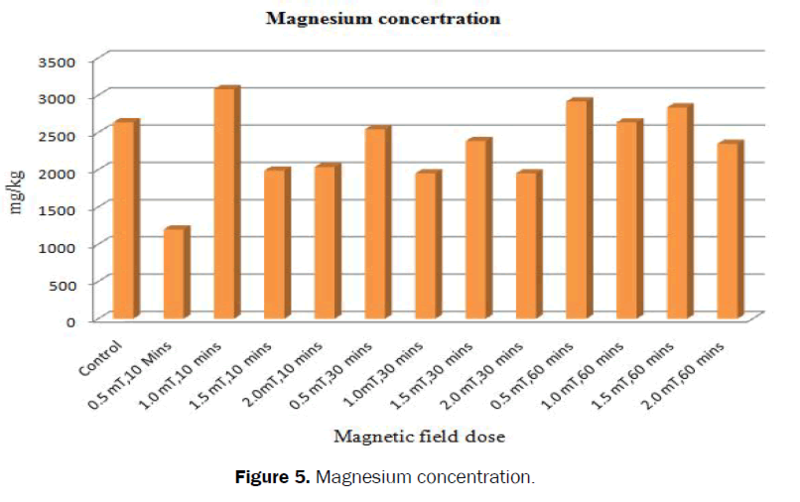 There is also a general increase in the content of magnesium with increase in time and magnetic flux density and (1.5 mT, 10 minutes) has the highest concentration. 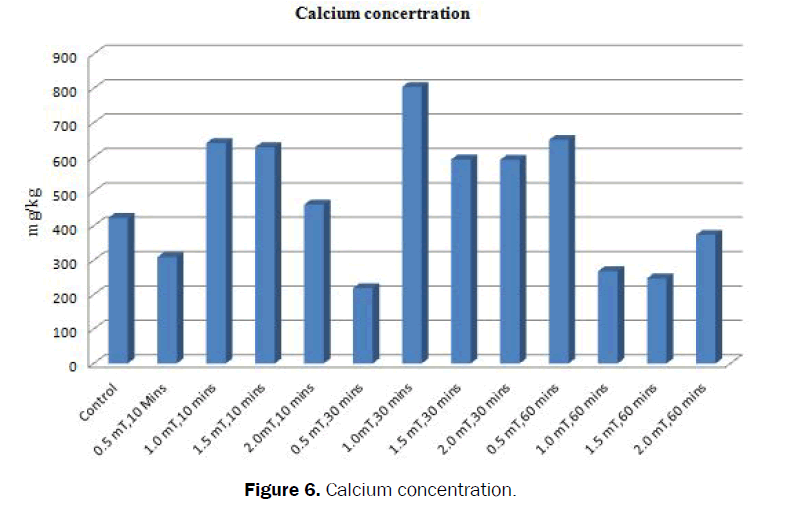 Between (1.0 mT, 10 minutes) and (0.5 mT, 60 minutes) there is an increase in calcium concentration. This study confirms the conclusions from the ICR theory that there are “windows” when magnetic field is exposed to plants. The term “windows” has been used to refer to specific combinations of magnetic flux density and time of exposure that give rise to specific responses. In this case there specific combinations that have given rise to remarkable increase in concentration of each element. This study therefore puts forward that the above combinations are the “windows” for increasing concentration of elements in spinach plants after exposure to magnetic field. Other studies have proposed that there are “windows“ include, an increase in calcium ions in the brain when exposed to magnetic field of certain frequency, time and time of exposure . According to the Ion cyclotron theory, specific intensities and frequencies of magnetic field can only give rise to an increase elemental composition in cells . This theory has been contradicted with results that have used static magnetic field, this study is one of them. However there are elements of this theory that are confirmed by study: Those specific ions will respond differently to magnetic field, in terms of accumulation in plants, this is evident by the variation in concentration of different elements. Although time of exposure has been reported to be a variable in the exposure of magnetic field to plants, the trend is always ignored. There is a particular trend that emerges when magnetic field is exposed to plants, when using time as a variable for specific parameters, in this study, elemental concentration. This trend is specific to each element. Magnetic flux density has an effect on elemental composition of spinach. However, the changes in the elemental composition can also be explained by the principle of magneto hydrodynamics. Magnetic field increases the surface tension of water and this has an effect on the absorption of ions from the soil and thereby affects the accumulation of elements in plants [41,42]. Exposure of spinach to magnetic field can therefore be used as a way to increase the minerals in spinach and as a result this solves mineral deficiency in developing countries. However there is need for further studies to investigate mechanisms of how magnetic fields affect biological systems. FAO, WFP, IFAD. The State of Food Insecurity in the World 2012. Economic growth is necessary but not sufficient to accelerate reduction of hunger and malnutrition. Rome, FAO. 2012. Horton S. The economics of food fortification. J Nutr. 2006;136:1068-1071. Alexander MP and Doijode SD. Electromagnetic field, a novel tool to increase germination and seedling vigour of conserved onion (Allium cepa L.) and rice (Oryza sativa, L.) seeds with low viability. Plant Genetic Resources Newsletter. 1995;104:1-5. Carbonell MV, et al. Stimulation of germination in rice (Oryza sativa L.) by a static magnetic field. ElectroMagnetobiology. 2000;19:121-128. Marks N and Szecówka P. Impact of variable magnetic field stimulation on growth of aboveground parts of potato plants. Int. Agrophys. 2010;24:165-170. Harichand KS, et al. Effect of magnetic fields on germination, vigour and seed yield of wheat. Seed Research. 2002;30:289-293. Khan MM, et al. Free radical accumulation and lipid peroxidation in testas of rapidly aged soybean seeds: A light promoted process. Seed Sci Res. 1996;6:101-107. Kiranmai V. Induction of mutations by magnetic field for the improvement of sunflower. J Appl Phys. 1994;75:7181. Hameda El Sayed and Ahmed El Sayed. Impact of magnetic water to improve the growth, chemical composition and yield of Broad bean (Vicia faba bean L) plant. American J Experimental Agriculture. 2014;4:476-496. De souza A, et al. Effect of magnetic treatment of tomato seeds (Lycopersicon esculentum Mill.) on germination and seedling growth [in Spanish]. Invest Agr Prod Prot Veg. 1999;14:67-74. Martínez E, et al. A static magnetic field of 125 mT stimulates the initial growth stages of barley (Hordeum vulgare L.). ElectroMagnetobiology. 2000;19:271-277. Kordas L. The effect of magnetic fields on growth, Development and Yield of spring wheat. Pol J Environ Stud. 2002;11:527-530. Dhawi F, et al. Static Magnetic Field Influence on Elements Composition in Date Palm (Phoenix dactylifera L.). Res J Agric Biol Sci. 2009;5:161-166. Esitken A and Turan M. Alternating Magnetic Field Effects on Yield and Plant Nutrient Element Composition of Strawberry. Acta Agric Scand Sect B Soil and Plant Sci. 2003;54:135-139. Ruzic R and Jerman I. Influence of Ca2+ in biological effects of direct and indirect ELF magnetic field stimulation. ElectroMagnetobiology. 1998;17:205-216. Del Giudice E, et al. On the "unreasonable" effects of ELF magnetic fields upon a system of ions. Bioelectromagnetics. 2002;23:522-530. Ritz T, et al. A Model for Photoreceptor-Based Magnetoreception in Birds. Biophys J. 2000;78:7070-718. Parola A, et al. Radical scavengers suppress low frequency EMF enhanced proliferation in cultured cells and stress effects in higher plants. The Environmentalist. 2005;27:103-111. Fujimura Y and Lino M. Magnetic field increase surface tension of water. J Phys Conf Ser. 2009;156:12-28. Adair RK. Hypothetical biophysical mechanisms for the action of weak low frequency electromagnetic fields at the cellular level. Radiat Prot Dosim. 1997;72:271-278. Ahmad M, et al. Magnetic intensity affects cryptochrome-dependent responses in Arabidopsisthaliana. Planta. 2007;225:615-624. Liboff AR. Cyclotron resonance in membrane transport. NATO ASI Series A. 1985;97:281-96. Pazur A and Rassadina V. Transient effect of weak electromagnetic fields on calcium ion concentration in Arabidopsis thaliana. BMC Plant Biol. 2009;9:47. Flórez M, et al. Exposure of maize seeds to stationary magnetic fields: effects on germination and early growth. Env Exp Bot. 2007;59:68-75. García F and Arza L. Influence of a stationary magnetic field on water relations in lettuce seeds. Theoretical considerations. Bioelectromagnetics. 2001;22:589-595. Goodman EM, et al. Effects of electromagnetic fields on Molecules and cells. Int Rev Cyto1. 1995;158:279-338. Belyavskaya NA. Biological effects due to weak magnetic field on plants. Adv Space Res. 2004;34:1566-1574. Lebedev IS, et al. After-effect of a permanent magnetic field on photochemical activity of chloroplasts. Sov Plant Physiololgy. 1977;24:394-395. Muraji M, et al. Primary root growth rate of Zea mays seedlings grown in an alternating magnetic field of different frequencies. Bioelectrochem Bioenerg. 1998;44:271-273. Celestino C, et al. Influence of chronic exposure to an electromagnetic field on germination and early growth of Quercus suber seeds: preliminary study. Electro- Magnetobiol. 2000;19:115-120. Cai R, et al. The effect of magnetic fields on water molecular hydrogen bonds. J Mol Struct. 2009;938:15-19. Pietruzewski S. Effect of magnetic seed treatment on yields of wheat. Seed Science and Technology. 1993;21:621-626. Pittman UJ. Effects of magnetic seed treatments on yields of barley, wheat, and oats in southern Alberta. Can J Plant Sci. 1977;57:37-45. Till U and Hore PJ. Radical pair kinetics in a magnetic field, Molecular Physics. 1997;90:289-296. Miura T, et al. The Spin Mixing Process of a Radical Pair in Low Magnetic Field Observed by Transient Absorption Detected Nanosecond Pulsed Magnetic Field Effect. J Phys Chem A. 2006;110:4151-4156. Timmel CR and Henbest KB. A Study of Spin Chemistry in Weak Magnetic Fields. The Royal Society. 2004;362:2573-2589. Plenio MB and Huelga SF. Dephasing-assisted transport: quantum Networks and biomolecules. New J Phys. 2008;10. Black CA. Methods of soil analysis. Part 2. Chemical and microbiological properties. 2nd Edn, Amererican Soc Agro. Madison, Wisconsin, USA 1982. Blackman CF, et al. Induction of calcium-ion efflux from brain tissue by radiofrequency radiation: effects of modulation frequency and field strength. Radio Sci. 1979;14:93-8. Sakhnini L. Influence of Ca2+ in biological stimulating effects of AC magnetic fields on germination of bean seeds. J Magn Magn Mater. 2007;310:e1032-e1034. Hasaani AS, et al. Experimental study of the interaction of magnetic fields with flowing water. Int J Basic App Sci. 2015;3:1-8. Maheshwari BL and Grewal HS. Magnetic field increases surface tension of water and electrolyte solutions. J Colloid Interface Sci. 2009;316:996-1002.